The care you take now in applying good methods of storage for your keepsakes and other items will make a big difference later on. 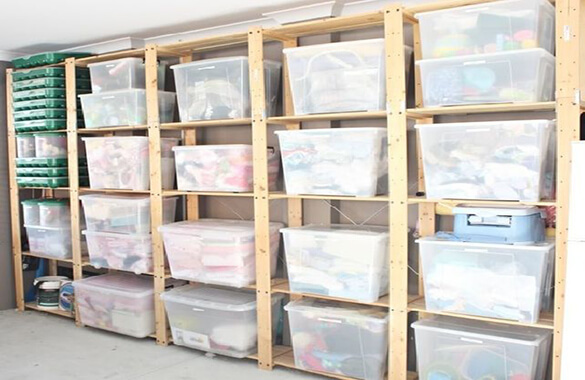 This, the fourth “Storage 101” post, gives guidance in selecting storage containers and following recommended procedures to keep your stored items safe. At the bottom, you’ll find links to a variety of useful storage products as well as to sites with technical information on proper storage of keepsakes. Following the tips in this article will help you protect your treasures and give you peace of mind. Research a variety of storage systems so that you can choose ones that will work best for you and your family. Storage systems range in size and complexity. One example is a system of lidded plastic boxes with removable compartments that allow you to customize each box’s interior space any way you like. Another option is a storage system with a long wire rack that installs across the exposed beams of the basement ceiling. Plastic storage boxes rest on the rack, each box sized to fit between the beams. One more system you might consider is a set of storage boxes that fit on shelves hidden behind the doors of an unused closet or cabinet. Store valuable or irreplaceable items in containers that are resistant to fire and moisture. Store fine linens in acid-free boxes. Separate the linens with acid-free tissue paper. Protect other fabrics by wrapping or draping them with unbleached muslin before they are stored. Protect heirloom plates and bowls by placing felt pads between each dish. Store old photographs in polyester sleeves. Place a few desiccant packets in each packed storage box to absorb moisture and help prevent mold or mildew. Control the climate in your basement by providing adequate ventilation and running an air conditioner or dehumidifier whenever needed. Keep the weight of your storage boxes manageable. Put lighter items such as blankets or seasonal clothing in larger boxes and heavy items in smaller boxes whenever possible. Inventory all items that you store in the basement, and keep a chart or diagram that shows where in your basement they can be found. Go through your storage inventory once a year to determine items that no longer are important to keep. Remove such items from storage. Find them a new owner, or take them to the dump. Label the top and front of every box as to its contents. In addition, affix a label to the inside of each box’s lid. Alternatively, store items in colored see-through plastic containers. Decide what color to use for each type of item (i.e. seasonal clothes, decorations, heirlooms). DON’T store items that can be harmed by moisture anywhere near your washer and dryer. DON’T store fabrics near windows or stoves. DON’T expose heirloom or keepsake fabrics to the sun’s ultraviolet rays. DON’T let stored fabrics come in direct contact with cedar or other wood. The wood’s acid can damage the fabric. DON’T store clothing in plastic bags. Dry-cleaning bags and other plastic bags often are made of materials that shed gaseous chemicals. When this happens in enclosed areas that have little air, the fumes may damage the cloth. DON’T store print photographs in sleeves that contain polyvinyl chloride. This material reacts with photographic emulsion, which causes serious damage. DON’T store keepsakes made of metal in anything made of wood. Many wood products emit substances that cause metallic items to corrode. DON’T store anything you care about in cardboard boxes. Bugs and mice love them. Instead, use boxes made of polypropylene, polyethylene or polyester. These materials deter pests and are unaffected by water. 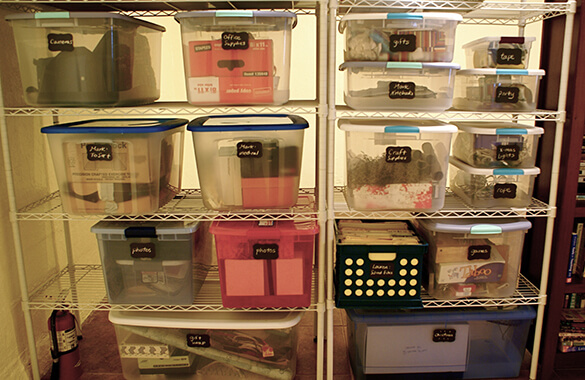 Here is a list of links to resources for storage boxes and other containers. Links to information sources on archival methods for preserving keepsakes also are included.